When faced with challenging circumstances which require legal counsel, it can be hard to know who you can trust. At Davis Disability Group we understand this sentiment and we vow to always be on your side. It’s our intent to stand alongside you through these challenging times to help see you through to better days. Our services are personalized and we take the time to answer all of your questions to ensure that you are comfortable with the process. If you are unable to work due to a physical or mental impairment, going through the disability process can be a very stressful period in your life. At Davis Disability Group, we are informed about this process and our focus is assisting you through this journey. Educate you as to how the disability process works. Keep you informed, and provide you and your claim with the personal attention it deserves. Organize and submit all necessary medical reports and evidence on your behalf. Fight to obtain the benefits you deserve. When you sustain an injury at work, it can often times be difficult to know what benefits you are entitled to and how to handle the insurance companies. At Davis Disability Group, we are informed about the benefits you should be receiving and know how to deal with the problems injured workers encounter on a daily basis. Davis Disability Group can handle your worker’s compensation claim no matter what stage you are currently in. Provide your claim with the personal attention that it deserves. Assist you with obtaining all necessary medical records and reports. Attend all pre-trial conferences and hearings. Provide you with a step-by-step process through your claim while keeping you informed. Fight on your behalf to obtain the benefits to which you are owed. Communicate with the worker's compensation insurance carrier on your behalf. Our focus is Social Security Disability and Worker’s Compensation, but we can assist you with personal injury or wrongful death cases as well. When you or a loved one has been involved in a serious personal injury accident or are going through the grief of a loss it is a difficult time to make an informed decision about legal representation. Let us help you through that process. If you have suffered personal injury or the loss of a loved one due to the negligence of someone else, we can assist you by teaming up with a law firm to pursue your claim. Using our 35 years of experience, we can choose the appropriate firm to assist you in pursuit of the compensation that you are entitled to. There would be no additional attorney fee or cost to you by following this arrangement. 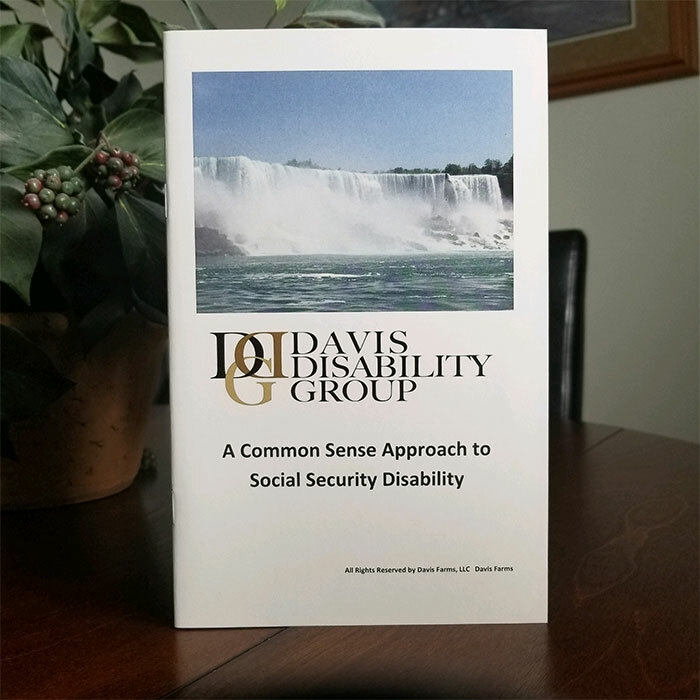 At the Davis Disability Group, we believe the best way to assist you is to represent you in our areas of focus or to team up with the firms that we believe can best serve your needs. We don't get paid unless you win.